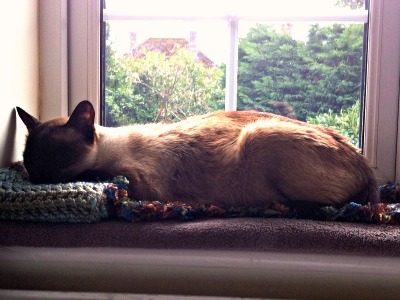 Welcome to March and this month's Meezer Musings! Here in the UK signs of Spring are starting to appear (very slowly, it has to be said) after a long, wet, windy, winter during which we've had storm after storm. Bandit is very happy about the reappearance of even the smallest amounts of sun - he hates the noise and drama of windy days, and takes himself off to hide under the duvet. 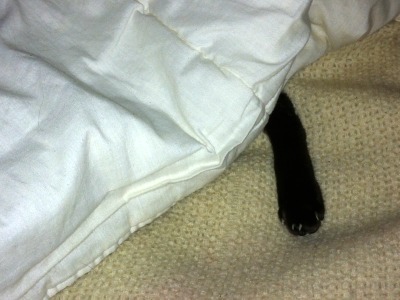 So what's in Meezer Musings this month? A very big thank you to everyone who completed Part 1 of our survey in February. There's a summary of some of your answers below, followed by Part 2 for you to complete. Then we have some new readers' stories, all of which are about kittens, an appropriate topic for the Spring! Rescued kittens, adopted kittens, and kittens from breeders too. Our Meezer of the Month is Cairo - sadly gone, but not forgotten. He lived a long and happy life and his special person Aurelia sent in a very touching memorial to him. We also received a couple of lovely, thought-provoking comments on two of our stories and I particularly wanted to share those with you. You'll find them in the blue sections below. 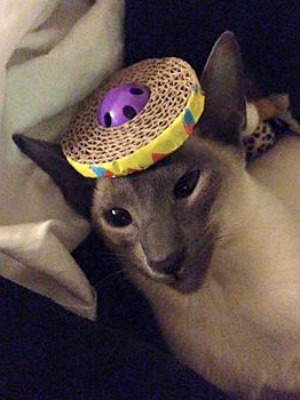 And, to end with, our Fun from Facebook section features a cat in an Easter Bonnet! I was equally thrilled to learn that we have readers on every continent (apart from Antarctica.) The majority in the United States and Canada, with Europe in second place, but we also had responses from Australia, New Zealand, Central and South America, Asia and Africa. You know who you are - and everyone is, of course, equally welcome to be here! I'm still working through and categorizing all the replies to the two 'open' questions (SO MANY responses and queries - thank you!) and I'll return to those in future newsletters. Number of cats you live with? Two-thirds of you have more than one cat. Most fall into the 2-3 cat range, but 10% have more than four cats - and a few people even have more than ten! Cat ages broke down into 25% in the 'kitten phase' of under one year old, 50% in the mid-ranges of 1-10 years and 25% in the senior to old range of 11 and over. It was lovely to see that there were a number of cats older than 20. Siamese are traditionally a long-lived breed; I have a feeling that current breeding methods may have shortened the general lifespan somewhat but I have no data to back this up - it's purely a suspicion. Point color. Nearly half of you have seal points, which is to be expected as seal is the most widely available point color. Next, and equal, came blue and chocolate; followed by lilac, flame/red and lynx/tabby - again, equally spread, with torties and the rarer cinnamon, caramel and fawn points bringing up the rear. Our final multiple choice question was 'breeder or rescue?' There was an even split (40% each) between those who'd got their cats from a breeder and those whose cats came from rescues or shelters. The remaining 20% were those who'd taken in abandoned or stray cats or rehomed them from friends or neighbors, so, in total, 60% of you have given cats in need a second chance on life. And I very much hope that 100% of our cats, whether from breeders or rescues, are now in loving, forever homes where they'll live out their lives in peace and comfort. If you didn't take part in last month's survey and would still like to do so, you can find Part 1 here. Survey Part 2: Where would you like us to go next? The internet and the way information is provided has changed hugely since this website has been in existence (seven years now!) and I've been wondering - does the website still meet your needs? Which direction should it move in? Part 2 of the survey is about you, your relationship with the internet, and how you'd like to see this website and related ideas develop in the future. There are seven questions, which shouldn't take more than about five minutes to complete. The more detail you can provide, the more I can help. As before, it's completely anonymous - you're not required to leave your email address or provide any personal details. So here goes ... thank you in advance for your help with this section! Answer each question and then click the 'Submit' button at the end of the survey. As you may know, my Bandit was a stray cat who was rescued by the Siamese Cat Club Welfare Trust in the UK before he found his way to me. I've often wondered who owned him before me. He was healthy and appeared well cared for when he was taken in by the rescue, but he wasn't microchipped and despite three months of searching for his owners in the area where he was found, they were never traced. This month a comment that speaks for itself was left on one of our stories by 'Rocky's Mom', who lost her seal point when he escaped from the house. "As I read these stories tears run down my face. 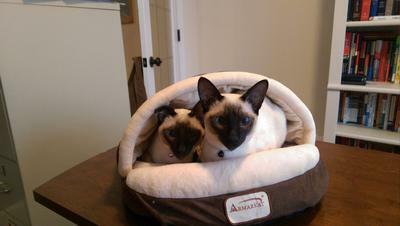 I am SO very thankful to those of you who are sharing your stories of your adopted Siamese cats. 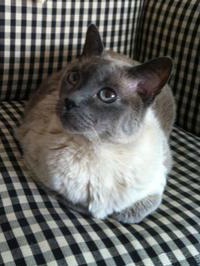 You see, I lost my beloved seal point Siamese boy about five years ago now. Thanks to all of you, and thank you to the special someone that I believe now has my special boy and is loving and caring for him in his forever home. Thank you all again for posting as it gives hope to us who have lost our loving pets." Five new kitten stories for you! Kayle from West Virginia told us how her kittens Cookie, Miah, and Snowbelle came into her life, and there's Shadow's story about her 'Sand Angel' kitten Marshmellow, a boy with flame point coloring born to a stray mom in a friend's garage. Jane in Virginia wrote about how she rescued her kitten, Possum Blue, from a feral colony, while Samantha, in Georgia found her kitten Cecil, a flame point abandoned in the road. Last but not least, Sara B in South Carolina tells us about her kittens Lily and Talulah, the 'Little Adventurer' and the 'Drama Queen'. Here they are, with that 'butter wouldn't melt in their mouth' look! A good companion from the first, he’d shadow me around the house and whenever I’d bound upstairs he’d try his best to follow, tiny kitten feet padding along." You can find Aurelia's lovely memorial to Cairo and read the full story here. Gwyn, who's written several stories about his own cats here on this site, left a comment on Cairo's story that perfectly sums up the memories and the love that our cats leave us with when they depart. "I read your account of Cairo's life and I loved every minute. You are obviously a real cat person who deeply understands the cat psyche. They are not just animals, they were irreplaceable friends and companions who are sorely missed but fondly remembered." With Easter coming up soon, I thought that this popular photo from Facebook last month was a particularly appropriate one - Erik Ling's boy Charlie, in his 'Easter Bonnet'! I asked Erik what this was and he told me that it's one of Charlie's favorite toys. I don't actually know what it does, but he looks very cute wearing it, doesn't he? I've been working through emails this month, and think I've now caught up! So if you've sent me a message through the Contact form on this site, you should by now have had a reply; if not, there were a few I replied to that came back as undeliverable, so they may have had mis-typed email addresses. If you think you're still waiting for a reply from me, please send your question in again through the Contact page here. That's it from us for March - we'll be back in April with further thoughts and follow-up from the survey. Thank you again for taking part!